Today was the first leg of my journey to Honduras! I flew to Chicago where I met up with Cassia, a Colts Cheerleader, and we shared the same flight down to Miami. Wasting no time getting to know each other, we talked the whole flight swapping stories about careers, family & friends, cheerleading auditions, and our “cheer life”. And of course, we HAD to see each other’s uniforms in person as soon as we got to the hotel! We had an overnight layover in Miami, so we hopped an Uber down to Ocean Drive on South Beach and enjoyed dinner by the beach. I have only seen Miami’s airport, so I was so excited to see the South Beach I have always heard so much about. There really were shops and restaurants everywhere! Both of us being from the Midwest and in the middle of winter back home, we just had to walk along the beach and stick our feet in the ocean. Back in the room we are heading to bed early tonight so we are rested and ready for a jam packed day tomorrow! We will hit the ground running when we land with an appearance right off the plane! Goodnight Miami, it’s been fun! On to Honduras!! We had a short flight to Honduras, only two and a half hours. I had heard the landing in Toncontín International Airport in Tegucigalpa is one of the most dangerous airports in the world! Apparently, the approach the aircraft has to take is really difficult and turns the plane sideways. I am normally not afraid of flying, but I was really interested to see how bad of a landing it was going to be! We must have had a really excellent pilot that day, because it really wasn’t bad at all, for the record. He just hit the brakes hard when we touched down. The whole plane erupted in applause for his achievement! When we got off the plane, we were greeted by SMSgt Tuson with the Air Force of Soto Cano Airforce Base. As “distinguished visitors” to the base, we went through the “Diplomats” line in customs and were escorted through the airport. It was such an incredible welcome! After a short bus ride, we arrived at the U.S. Embassy in Tegucigalpa, Honduras and were introduced to Ambassador James Nealon. We enjoyed mingling with Department of Defense personnel and Armed Forces assignees. After the Embassy, we took a two hour bus ride to the remote military base near Comayagua. We were given the best rooms on base and had dinner with the troops in the dining facility. 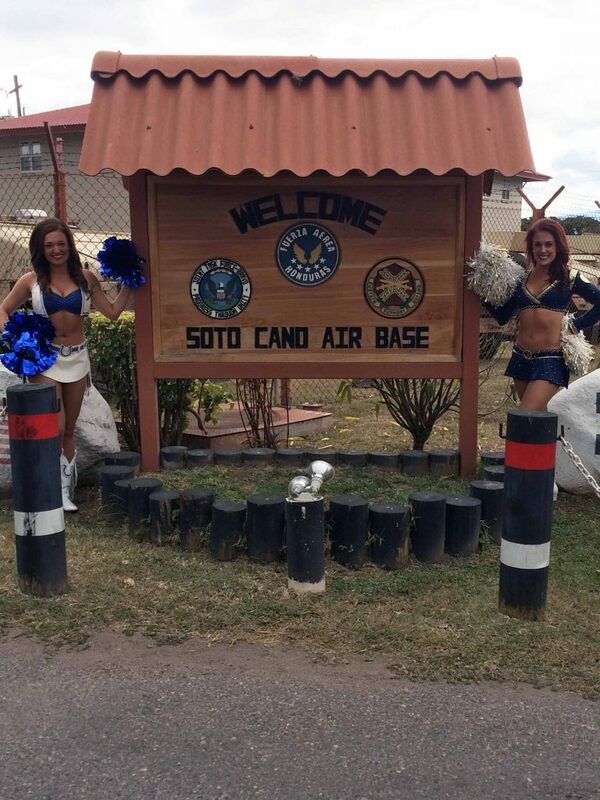 Soto Cano Air Base is a Honduran Military installation that has approximately 500 U.S. military personnel in addition to the Honduran forces stationed there. While on the bus ride to the base, we learned that the main mission of the base is to combat human and drug trafficking through Central America and up to the United States. The military works with the Honduran forces to help train them in these efforts and assist. Not only do our servicemen and women focus on the main mission, but they also do tons of humanitarian efforts in the Honduran community! They volunteer at orphanages, hike medical supplies out to the nearby towns, and bring medical teams to provide care to the people. When locals see the military personnel coming, they are excited to see the supplies they are bringing for the community. I am completely humbled by the amount of service these men and women offer the local community and our country. Having never been to a foreign military base, I am so grateful to be able to see these amazing acts firsthand and have a deeper understanding and appreciation for our military efforts. This morning we were up early to meet the servicemen and women for their Army and Air Force flag football tournament! The NFL Players traveling with us were excited to jump in and coach. It was really great getting to see the men and women having fun and cheering them on from the sidelines. Honduras is considered a hardship deployment because the troops cannot bring their families with them and the base is remotely located. Fun activities and visitors like us to the base offer a nice break from reality for them.After the tournament, SMSgt Tuson and a group from the base took us into a nearby town, Comayagua, for some site seeing! Comayagua is known as “Donkey City” because historically water was transported into the city on donkeys. We visited the Comayagua Cathedral, built back in the 18th century and boasts the oldest working mechanical clock in Central America. We were able to watch the dancing bell ringer simultaneously ring four bells in the bell tower with a maze of ropes tied to his arms and legs. Quite an impressive routine! After passing through the cultural museum of Comayagua, we enjoyed a delicious, authentic meal at Ricardo’s Restaurant with our military group. We have a full day tomorrow with the Super Bowl, and are so excited we can barely sleep tonight! It’s Game Day!! !We started out the morning with a visit to the flight line. This is hands down one of the coolest things I have ever seen in my life. All of the black hawks, medical helicopters, and chinooks are parked on the tarmac and create such an overwhelming presence as we drove up! We spent the next few hours crawling in and out of the aircraft, and even up on top (you climb up the side of a chinook like a rock climbing wall)! There were so many buttons and levers, I can’t imagine how much training and studying goes into learning how to operate these aircraft. I was completely amazed by the pilots and their stories of flying and training. It was really neat to hear how organized and disciplined the processes are. Everyone on board has a job and an exact time to do that job to ensure the safety of the entire crew. It was incredible to see how important it is to work in unison as a team and be able to trust your teammates on missions. I was so impressed and overwhelmed with the amount of dedication, talent, and bravery our service personnel display. After the flight line, we headed to the fire department. I had no idea what kind of fun I was in for! When we arrived, we were greeted by a little 13 week old puppy named Striker. The Air Force allows a Firehouse Mascot, so this little black ball of fur is their new addition to the Firehouse. The team had all of their equipment layed out for us to learn about—the jaws of life, a firefighting suit & all the gear, and athe firetrucks were pulled up waiting for us to explore! First we watched one of the men put on his gear in a required minute and thirty seconds. It was incredible! There were boots, fire proof layers, masks, hair covers, air tanks, and gloves. I felt like I was watching Superman change in a telephone booth! Cassia and I tried our hand at putting all the equipment on as fast as we could—we both did pretty good at just over 2 minutes! 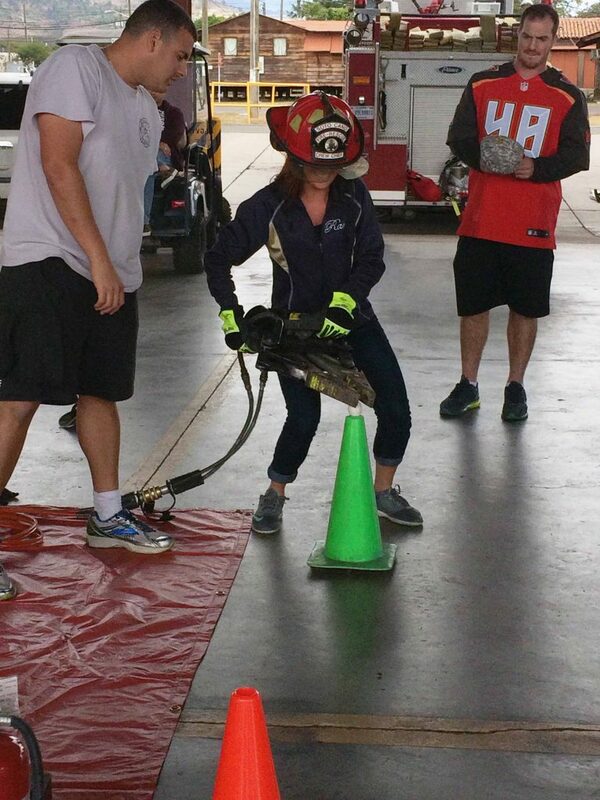 Next, we got to hold (the very heavy) jaws of life and operate them. It was unbelievable. A few guys set up an egg on the top of the cone and had us try to grasp it with the jaws and move it. The players did a great job and were able to successfully do it! The jaws were so heavy for me I had trouble, but was at least able to grasp the egg. I have got to up my bench presses to contend with this! After the egg contest, we were taken over to the fire engines where we were told to hop in. They drove us out to the flight line and said “Ok, you guys drive!”. I couldn’t believe it! Next thing I know, I’m in the driver’s seat and driving a fire engine down the runway. That is like every kid’s dream! And if that wasn’t good enough, they told me to shoot the water. No way. I pulled the gage and fired away and off the top of the truck water went shooting out everywhere! It was an incredibly amazing experience.After our fun morning exploring the aircraft and firehouse, we headed to a handshake visit to meet with the men and women stationed there and signed autographs. After our quick visit, we headed back to the room to change into our official Game Day uniforms and head down to the Super Bowl Party! Usually, I just watch the Super Bowl with a couple of close friends at my house, so this was actually my first big Super Bowl party experience! The men and women on base all headed down to “The Last Resort” restaurant on base where it was decorated with tons of streamers and 50thSuper Bowl decorations everywhere. When we walked up everyone was outside grilling and playing volleyball and bags (or corn hole as I learned it was also called). We wasted no time and jumped in on a game. Another confession—although I went to college at the University of Illinois and “bags” is a very common game, I have somehow made it through my life never having played it until now. I must say, I did a pretty good job for a first timer and our team won! After a few games of bags, we headed over to a ping pong table and played water pong with a few guys who were on call. It was really great getting to spend so much one-on-one time with the men and woman. While playing with them, I got to have long conversations and learn about their families, other deployments, their role in the military, and their future goals for their careers. After the pregame fun, we headed inside to eat and watch the game. Cassia and I went around talking with everyone and signing posters and enjoyed some great food while we watched the game. The energy in the room was overwhelming. You could tell watching the game like they would at home was a familiar activity that brought comfort to the men and women who had been away from their families and friends for so long. I was so blessed to be a part of the day with them. I can’t believe the day is over already and that we are already heading home tomorrow. This trip wasn’t nearly long enough and I’m not ready to leave yet. It has been an incredible visit and I have done things that I never thought I would ever do! A guy named Will on base showed Cassia and I a video of The Andrews Sisters visiting Soto Cano back during WWII. It is a video that is played in the airport apparently. The Andrews Sisters were an American singing group of the swing/boogie-woogie era and they entertained on bases to boost morale. There is a video on YouTube (https://www.youtube.com/ watch?v=vhJm1Ps6vdM) showing a performance where they are singing a song specifically about Tegucigalpa. It’s catchy and will never leave your head once you hear it—check it out. I’ve been singing it all weekend. I can’t believe that ProTour Productions and Armed Forces Entertainment brought us to the base and I was able to entertain the troops just as the Andrews Sisters did back then. It’s pretty incredible to be part of something so meaningful. As I think of returning home to my family and to my “normal” routine tomorrow, I am so humbled by the sacrifices our military personnel make every day. Thank you so much for service and all you do for our country. To the men and women of Soto Cano, thank you so much for hosting us, teaching us about your efforts, and giving us an experience of a lifetime!